Jerome Myers said of his art, "I went to the gutter for my subject, but they were poetic gutters." Jerome Myers was called "the gentle poet of the slums" for his compassionate images of immigrant life in New York's Lower East Side. 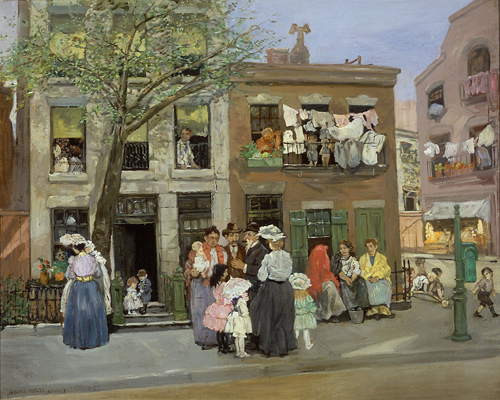 Myers recorded the unglamorous, yet commonplace aspects of city life, as did fellow painters John Sloan and Robert Henri, members of The Eight or the Ashcan School. However, his vision of the city's poor never evoked a sense of wretchedness: "Why catch humanity by the shirt-tail," he said, "when I could see more pleasant things?" Though tame to us today, paintings like Sunday Morning were considered progressive, even "revolutionary" when they were painted, because of their subject matter. However, when it came to exhibiting with The Eight, Robert Henri didn't think that Myers's work was forceful enough. As a founder of the innovative American Association of Painters and Sculptors in 1911, Myers helped to pave the way for the watershed 1913 Armory Show in New York City, the exhibition that introduced European modernism to an enthusiastic but occasionally bewildered public.